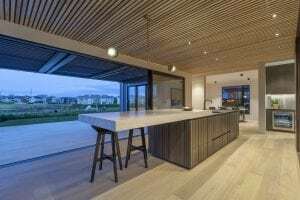 The client, an architectural Design & Build company sought to create a new home in the desirable suburb of Karaka Lakes. The brief was to create a kitchen suited to a professional couple who enjoy entertaining and have an appreciation of architectural design. The kitchen is situated within an elongated room that opens up to an extensive deck forming a large open plan entertaining area with an outward view to the lake. The challenge was to create a large, highly functioning kitchen with multiple working zones that weren’t apparent upon first sight. Drawing on inspiration from Milan, large pocket doors and fully integrated appliances form the main elevation, that when opened, reveal the inner workings of the space. Directly adjacent sits a scullery, which can be accessed without interrupting the main workflow of the kitchen. The exterior form of the home was designed to draw upon the surrounding environment, which was echoed in the interior by the continuation of vertical lines. 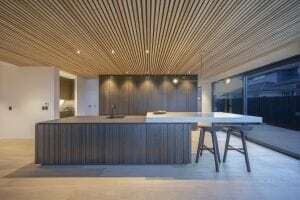 The clients’ vision was for the kitchen to fit seamlessly within the architectural styling of the home which is why I selected materials such as hand-crafted vertical timber panelling to the island, stained textured veneer to the back wall and scullery, flat plate Stainless Steel and a cantilevered Limestone benchtop sitting upon a Matt Black bench. The result, a highly functional space, perfect for entertaining that integrates flawlessly with the material palette and design aesthetic of the home, providing the potential purchaser with ultimate living experience. 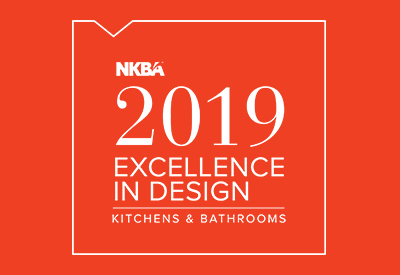 2019 NKBA Excellence in Design Awards Entries Now Closed! Best of luck to all who entered. 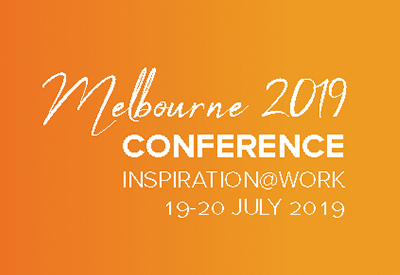 Register for the 2019 NKBA Conference & Excellence in Design Awards now! Book your accommodation here too!
. 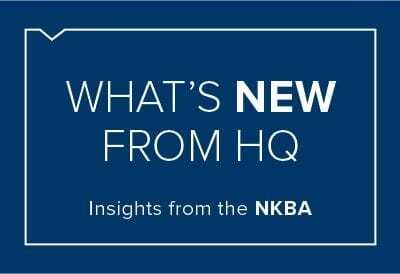 To help you in your prep for one the biggest events in the NKBA calendar, we have put together answers to some of the more frequently asked questions.